A 20 acre business park is at the centre of Lomondgate development on the north edge of Dumbarton. With state-of-the-art facilities, flexible accommodation, excellent access to the travel network and attractive surroundings this is an ideal business location. The buildings are designed to a high standard with the emphasis on providing quality accommodation in a mature landscaped setting. The pavilions offer 300,000 ft flexible accommodation tailored to suit individual occupiers requirements, including small to medium sized business units. Anchor tenant, BBC Scotland, is making an additional significant investment in further production facilities alongside the existing River City studio. 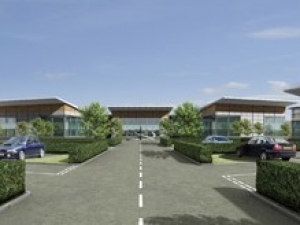 The development of the associated roadside services and retail facilities provided on-site services for the business park to ensure staff are fully catered for within their working environment.